Most mountaineers, both actual and armchair, know that for two months each spring, Everest and the other big Himalayan peaks become the epicenter of the climbing world. From April to June, hundreds of mountaineers from around the globe descend on Nepal and Tibet with the expressed goal of scaling one of the tallest mountains on the planet. As a result, Base Camps across the region can become noisy, dirty and overly crowded, which dramatically detracts from the experience, to say the least. But not everyone knows that there is a second climbing season that arrives in the fall, after the monsoon has departed for another year. The fall season is much quieter and more tranquil than the spring, affording climbers more solitude in the mountains. The 2012 fall Himalayan climbing season officially got underway at the end of August when teams began arriving in Kathmandu. Most spent a few days in Nepal’s capital city organizing their gear and putting the final touches on their preparation before they begin the trek to their respective Base Camps throughout the Himalaya. That hike generally helps to start the acclimatization process that will prepare them for living at high altitude over the coming weeks. Often times the fall season is used to hone technical skills in preparation for bigger challenges to come. For instance, climbers who are planning a spring ascent of Everest will often visit the Himalaya in the fall to gain valuable experience and assess their body’s ability to adapt to the thin air. For some it will give them the valuable tools they’ll need for taking on the world’s tallest mountain, while others will learn that the Big Hill is ultimately out of reach.The two mountains that will receive the most traffic this fall are Makalu and Manaslu, the fifth and eighth tallest peaks on the planet respectively. Of those, the 8481 meter (27,825 ft) Makalu is considered a more challenging climb. The lone peak, located along the border of Nepal and Tibet, features a distinct pyramid-shaped summit that provides plenty of technical challenges including a final approach that mixes both rock and ice. Manaslu, on the other hand, features a double summit, the tallest of which extends 8156 meters (26,759 ft) into the sky. While not quite as difficult as Makalu, it does indeed make an excellent testing ground for climbers looking to move on tougher peaks. Cho Oyu, another popular destination for fall Himalayan climbers, is off limits this year due to the continued closure of the Tibetan border by the Chinese. 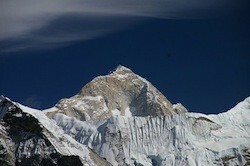 That 8201 meter (26,906 ft) mountain is also a good tune-up in preparation for a spring attempt on Everest. But because of on going protests inside Tibet, no entry visas are currently being approved. That has caused several expeditions to change their plans and move their climb back into Nepal instead. While the fall season is much less crowded in the Himalaya the weather also tends to be more unpredictable as well. At the moment it is calm and warm there, but winter tends to arrive early in that part of the world, which means climbers could easily be dealing with high winds and heavy snows before they’re through. Most of the fall expeditions will be between a month and six weeks in length. In the early weeks the climbers will mostly be concentrating on acclimatizing to the altitude while they slowly build a series of camps that they’ll use in their final push to the summit. Once that process is complete, they’ll simply wait for the weather to be right to facilitate their summit bids. If they’re lucky they won’t have to wait long, but more often then not they can end up waiting for a number of days before conditions are right to go for the top. And when they’re done, they’ll head home rest, recuperate and begin planning their return to the mountain in the spring.